The most famous of these furry forecasters is Punxsutawney Phil from Pennsylvania – he was portrayed in the 1993 film, “Groundhog Day”. Here in New York City, our local weather-groundhog is Charles G. Hogg. A resident of the Staten Island Zoo, he is more popularly known as “Staten Island Chuck”. This year, the two groundhogs had a difference of opinion. 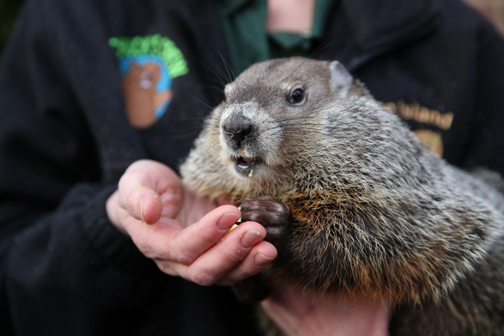 Phil predicts six more weeks of winter and Chuck is calling for an early spring. But, shadow or no shadow, as the planet warms spring is trending earlier. Below is a look at the temperature trend during the six weeks following Groundhog Day since 1950 in New York City. Long-range forecasts can be a tricky business, so we will have to wait and see what actually happens. Either way, the spring equinox is 46 days away. The most famous of these furry forecasters is Punxsutawney Phil from Pennsylvania – he was portrayed in the 1993 film, “Groundhog Day”. Here in New York City, our local weather-groundhog is Charles G. Hogg – more popularly known as “Staten Island Chuck”. This year, neither groundhog saw its shadow and both are predicting an early spring. Long-range forecasts can be a tricky business, so we will have to wait and see what actually happens. Either way, the spring equinox is 47 days away. At the end of a rainbow, according to Irish folklore, lies a leprechaun’s pot of gold. In reality, however, the true end of a rainbow is impossible to locate. A rainbow is an optical phenomenon that forms when water droplets in the air both refract and reflect sunlight to reveal the colors of the visible spectrum in an arch formation. It is not a physical entity that can be touched or approached. To see them, the National Center for Atmospheric Research says you need to be both facing the source of moisture and be standing at a 42° angle to the sun’s rays. This specific line of sight means that no two people will ever see the exact same rainbow. It also means that as you attempt to move closer to the rainbow, the further away it will appear. So, try as you might, you will never get close enough to see a rainbow’s true terminus. In the end, rainbows are all about perception. For many people, even without the promise of a pot of gold, the joy of sighting a beautiful rainbow is reward enough. Happy Saint Patrick’s Day! 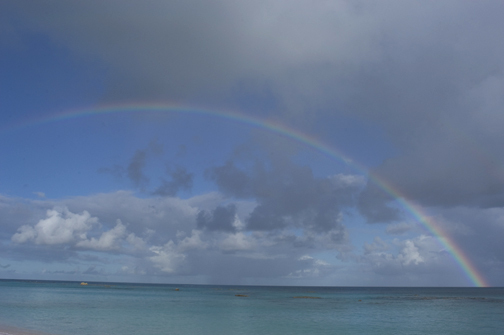 A rainbow appears to end in the Atlantic Ocean off Bermuda’s coastline. Image Credit: The Weather Gamut. In New York City, our local weather-groundhog is Charles G. Hogg – more popularly known as “Staten Island Chuck”. Earlier this morning, he saw his shadow and is predicting another six weeks of wintry conditions for the Big Apple. On the job since 1981, Staten Island Chuck’s “forecasts” have been correct about 82% of the time.